‘The God of the Gaps’ atheist argument is a delusion which requires the gullible victim to buy into a bundle of false assumptions. It attempts to position such things as the invention of the lightening Rod by Benjamin Franklin, or Galileo’s Heliocentric argument with the Church of Rome as examples of a supposed fundamental conflict between Religion and science… between Ignorance and truth… between superstition and reason, and that Religion only survives in ignorance… gaps in scientific understanding…when the reality is that none of these moments of science ‘Squeezed God’ in any way at all! To the degree that these things brought enlightenment, they merely dispelled some foolish beliefs… which needed to be exposed, and thereby helped to dispel error… not exorcise God out of existence. 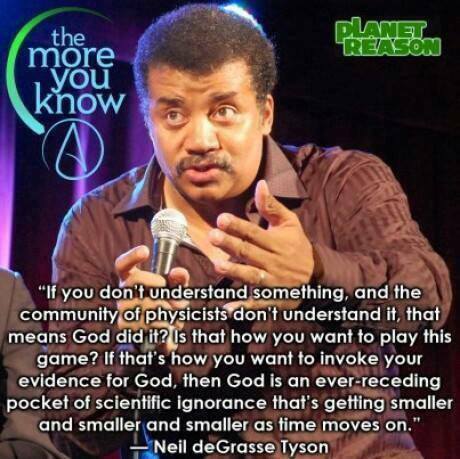 Proponents of the ‘God of the Gaps’ such as Tyson ignore the reality that most of the greatest advances in science have been made by Men of Faith… Believers in God, including Franklin, Galileo, Newton, Einstein, Plank, Mendel, Von Linaeus, etc. I appreciate that Newton suggested some astronomical observations were best explained by invoking the action of the deity, have today been explained as conforming to Natural Law not understood by Newton… and yet again I say this sort of advance does nothing to ‘squeeze out God’. The Bible clearly teaches that on the seventh day God rested from his work, and yet the Universe did not stop… ie God created the universe to maintain itself autonomously… and not require his constant attention and intervention. Indeed the concept of ‘Miracles’ only makes sense as special contraventions of this Autonomy and so by refuting Newton’s error on this point Science actually vindicates the this doctrine of Autonomy in the Bible. Ie Science and Scripture are rendered more harmonious, not less. 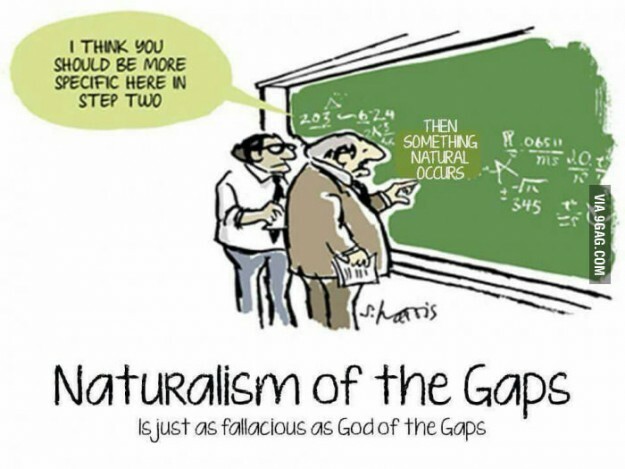 The God of the Gaps argument requires the gullible to believe that rather than purify an error, that such new understandings have somehow ‘reduced God’s domain’, yet none of this undermines the existence of God, or his necessity, or his activities as the foundation and originator by which the Universe came to be and is maintained. None of this make Materialism, or Evolution more believable. The truth is that contrary to this Atheist Boogie man modern science has been busy vindicating faith in the Scriptures, not undermining it… to the extent that Atheists have had to modify their position many times… from their belief that the universe is eternal, their belief in acquired characteristics, their belief in multiple ‘Human kinds’ , etc, etc. One of the clearest examples of this is the Atheists belief in ‘Simple cells’… They have been proven to be as mythical as Fairies! And these advances in real …non-speculative science is leaving Atheist Materialists Bare arsed… not theists! Thus with advances in genetics etc Belief in the Lord has become more Credible… more evidence based, and it is atheist materialism which is in retreat, and which relies more and more upon groundless theory and conjecture. Any pretence that Atheists occupy the high ground is laughable! That these rash mystics have the audacity to ridicule belief in God is the height of hypocrisy! The Bible believing Theist has nothing to fear from *Real science*… and yet it is the Atheists who resort to Law suits etc attempting to Ban Creationist theory from schools, and protest the appointment of Scientists and teachers whom believe in creation. Read this>>> Rabid Anti-Reason Atheists Priesthood Cry Blasphemy! The world is filled with Blind God haters… “Broad is the way that leadeth to destruction and many there be thereon…” The Christian must be strong in faith, and maintain the courage of their convictions in a world where lies are dressed up as ‘Science’… where immorality is dressed up as enlightened ‘humanitarianism’… etc etc. It is not our duty to convert the world or to establish Christ’s kingdom on Earth, but to preach the gospel of God’s grace, and to love our neighbors as ourselves. Satan is the Father of Lies… and men love darkness because their deeds are evil. 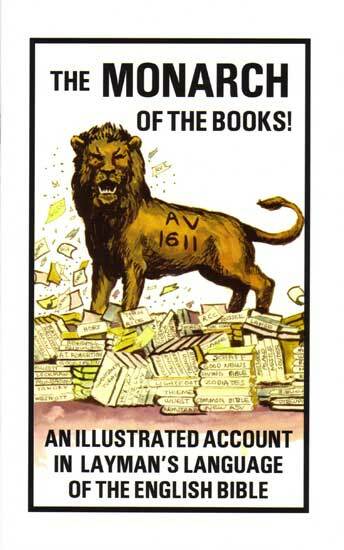 It is sad that many reading those quotes above will have hardened their hearts… seared their consciences… rather than dare to even contemplate that what the scripture says might be true. Way too Starry for Atheism! Please provide references for your statement. No evidence I have seen backs up this claim. Where? References, from credible academic journals, please. None of it proves that either, which is of course the more salient point for non-believers. It sure does, we have evidence for these ideas and none for yours (which is why God is being squeezed). Evolution and materialism win by available data. If you can provide us with counter-data that would be great, every scientist would welcome evidence that further clarifies our understandings of evolution. However, one piece of counter-data is unlikely to have an effect, you will need to counter the millions of pieces of data that make up evolutionary theory, across a range of disciplines. The conflict between science and religion is not just about specific facts, e.g. the development of life, or the interpretation of facts, e.g. if the universe is fine-tuned for life, but especially about what makes knowledge reliable. The religion-friendly researcher, Elaine Ecklund, in her survey of US scientists found that 34 per cent were atheists and just 27 per cent had some belief in a god. A survey of elite US scientists found that 93 per cent were unbelievers, though how scientific this survey is I’m not sure. Of course, these figures don’t prove science and religion are incompatible, but they do suggest there is a problem. You recommend we watch Expelled, but how trustworthy is it? I understand that Richard Dawkins is shown in the film as saying that life came from space, but anyone who has read his writings knows this is not his belief. According to Dawkins, he was pressed by the interviewer for an alternative scientific explanation to abiogensis and evolution, and he gave alien origins as an alternative, which he does not believe; through dishonest editing, this has been misrepresented as his view. You might not believe evolution is true, but the vast majority of biologists do. Fame, fortune and a Nobel prize await the person who proves them wrong. Michael Behe, who popularized the notion of the cell as impossible by way of evolution, was confronted several years later at the Dover trial where he was a witness, with 57 peer-reviewed studies showing evolutionary pathways to the cell, and was entirely unable to respond to them. Perhaps you need to be more careful with your scientific sources. See “ old.richarddawkins.net/articles/2394-lying-for-jesus” for his take on the designer as alien. It doesn’t look like it was edited to misrepresent Dawkins. I watched it. I don’t think it misrepresents Dawkins at all. If it does, it misrepresents him as being humble and honest! I was impressed. If you go to the Dawkins link I provided, you will see whether discussing modern organisms (for which we have a great deal of evidence) or the self-replicating chemical precursors to life (where our knowledge is more speculative hypothesis based on some experimental evidence) or entirely hypothetical aliens, Dawkins consistently assumes evolutionary processes (natural selection by material forces in the environment) rather than intelligent design. It is a little uncharitable to criticise RD for inconsistency on the basis of an off-the-cuff hypothetical which he doesn’t believe in. If you have to lie about the facts to make your case, that’s a pretty good sign that oyu don’t really have one, and calls into question EVERY ONE of your other claims which ostensibly support your point. Have you noticed that the continuing elimination of error never actually rejects any of the notions which the atheists support? Tom, Thanks for your comment. 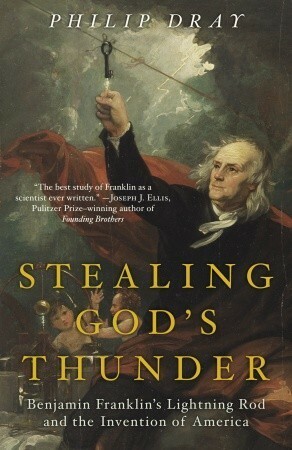 That Franklin was a Protestant/Deist has nothing to do with the argument about the ‘Science’ of his lightning rod as thwarting the Divine right of God to smote the Mankind. As for the rest…I am not surprised you question me at every point. I am saying the very opposite of what passes as Orthodoxy for our times. Yet I stand behind everything I write… until something comes along which convinces me to change my position.